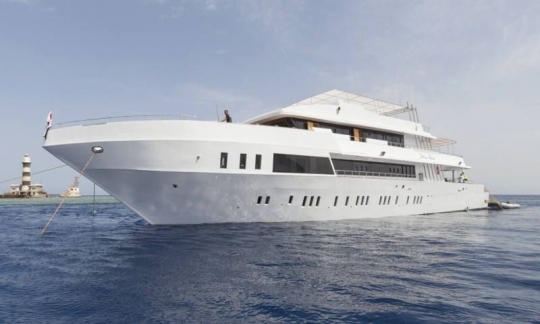 MY Blue Seas is one of the largest luxury liveaboards ever built in the shipyard of Alexandria in Egypt. 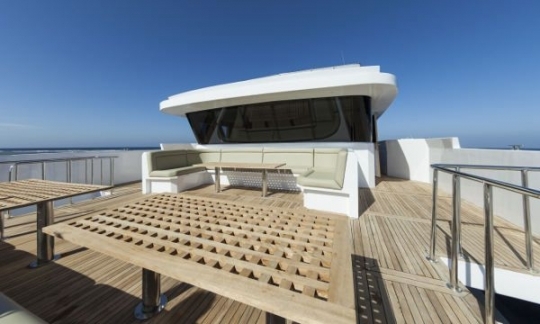 The yacht's hull sports lines from expert Italian boat makers, complemented by classic interiors. 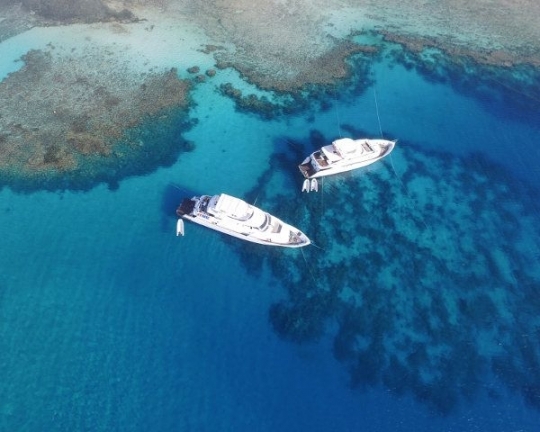 At 37 metres long and 8 metres wide, Blue Seas easily accommodates 22 guests on its Red Sea diving tours with room to spare. 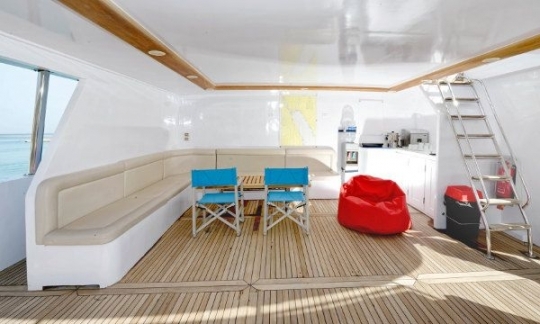 All the cabins on board take advantage of the spacious hull and are furnished with modern fittings. En-suite facilities and individually controlled air-conditioning are standard. There are double cabins available on the upper deck and twin cabins below. There is also a large Honeymoon Suite, occupying the whole of the lower bow section. The communal areas include a very large saloon on the main deck, with a separate dining area that features marble-topped dining tables. The saloon offers plenty of comfortable and stylish seating to make use of the well-stocked bar. 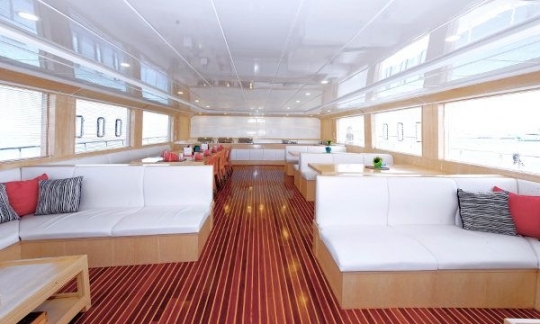 The bar lounge on the upper deck also has a TV and is often used for colourful photographic analysis of the day's diving in the Red Sea. 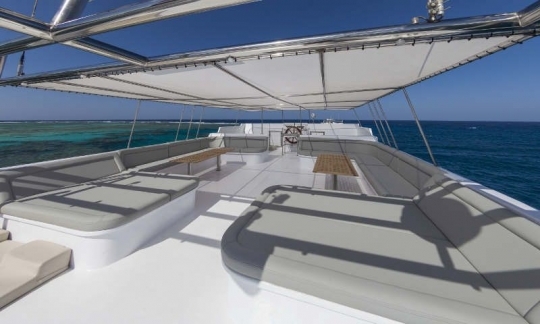 If you are keen to make use of the sun and work on your tan whilst you're in Egypt, Blue Seas has a large tanning area at the bow of the upper deck and a partially shaded flybridge, complete with sun loungers. 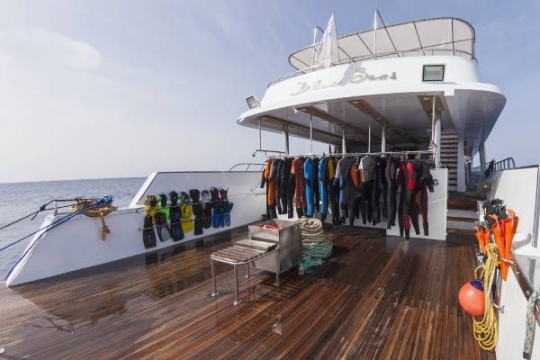 The diving deck is perhaps the stand-out feature of Blue Seas, there seems to be enough space for twice as many divers. So if plenty of room on the deck deck is a key feature that you look for in a liveaboard, the Blue Seas will meet your requirement. There's also free nitrox available, a camera table and charge points, plenty of rinse tanks and a bathroom. Pssst... and a quiet word about the food. Most guest feedback from trips on Blue Seas mentions how great the food was. Rumour has it that the chef has been headhunted several times by other boats, so let's hope this liveaboard can keep him and continue to serve up some of the tastiest food in Egypt. Cruise price per person includes: Cabin accommodation with air-conditioning, breakfast, lunch, dinner, snacks, water, bottled soft drinks and hot drinks, return transfers from Hurghada airport to boat for Hurghada departures and from Marsa Alam airport for Port Ghalib departures, dives (as detailed in the trips above), nitrox fills for certified enriched air divers, 2 experienced English-speaking divemasters, tanks, weights and weightbelts. Optional extras: Return transfers from Hurghada to Port Ghalib (US$ 51), alcoholic drinks, dive computer, torches. Unless otherwise stated, all the listed items need to be paid on arrival. How to get there: MY Blue Seas departs from Hurghada and Port Ghalib and return transfers are included from nearby hotels and from Hurghada and Marsa Alam airports to the departure point. There are direct flights from Cairo to Hurghada (1 hour) and Marsa Alam (1.5 hours) via Egypt Air. From certain destinations in the UK and Europe it is possible to fly into Hurghada and Marsa Alam direct. For more information see our travel information section for the Red Sea. The first and last nights of the diving tour are spent in the harbour. Guests arrive and board on the first day. The boat leaves the harbour on the morning of the second day. Full tourist visas are available only at the airport for citizens of certain countries, unless obtained in advance. Please ensure you understand the tourist visa requirements that apply to you. The last dive of the trip will be at around 10:00 hrs. Please wait at least 18 hours before flying after diving. 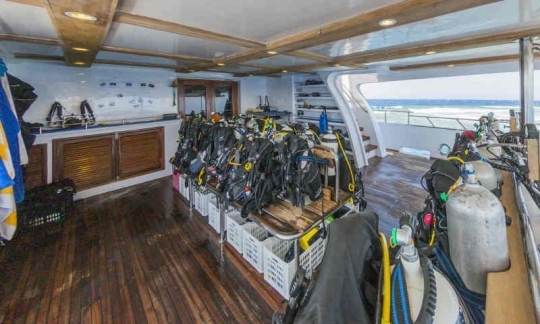 Dive clubs and group discounts: See whole boat charter rate below which is approximately equivalent to pay for 17 guests and 5 additional persons can join the cruise in Standard cabins free of charge (total 22 guests). 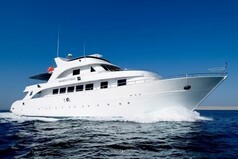 Whole boat charter rate (per night): US$ 3 712. There is an additional charge of US$ 754 for 2 dive guides on all whole boat charters. 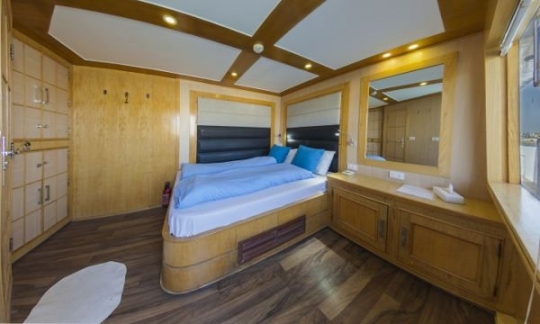 There are 12 cabins on this Egypt liveaboard consisting of 7 twin bed cabins and 1 double bed cabin located on the lower deck and 2 double bed cabins and 2 twin bed cabins on the upper decks. 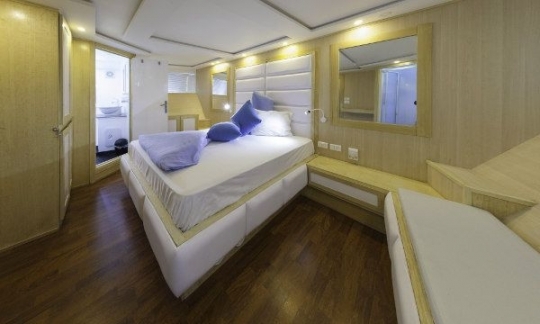 The double bed cabin on the lower deck is spacious and is suitable as a 'honeymoon suite'. All the cabins feature private en-suite bathroom facilities. 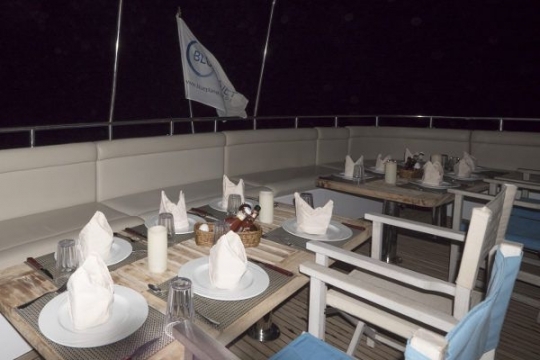 The menu on M/Y Blue Seas consists of international, Asian and the local cuisine of the Red Sea. The menus are not fixed and meals are served buffet style accompanied by waitress service, in the dedicated air-conditioned restaurant located on the main deck. Main meals comprise a pre-breakfast snack, breakfast, lunch & dinner, with snacks in between. Snacks include biscuits, candy bars, ice cream, bread/toast, cake and fruit, which along with a variety of teas, coffee, water and soft drinks are all complimentary. Beer, wine and other alcoholic drinks are available for purchase on board. Catering starts with lunch for early arrivals on the tour check-in day. Example dishes: Breakfast - cereals, pancakes, selection of cold meats and cheeses, eggs, toast; Salads, Moussaka, pasta dishes, kebabs, falafel, creme caramel.